Andrena Morrison Reis was born on 8 March 1916 at Los Silos de Calanas, Huelva, Spain, the daughter of Albert Victor and Jean (Morrison) Reis. She married William (Bill) Stanfield Charlesworth on 5 September 1940 at the Wilmslow Road Presbyterian Church, Withington, Manchester. Bill was born on 17 April 1914 at Stockport and died on 25 April 1977 at Mortehoe, Devon. Andrena married Ronald (Ron) Maycock on 9 June 1989 at the Registry Office, Barnstable, Devon. Ron was born on 23 October 1916 at Ripley, Nr Belper, Devon and died on 17 October 1995 at Barnstable, Devon. Andrena died on 13 May 1997 at North Devon District Hospital, Barnstaple, Devon. 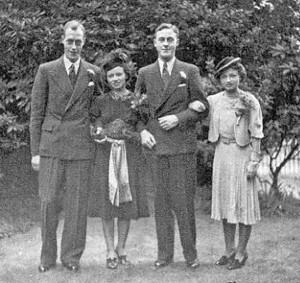 From left to right: William Charlesworth and Andrena Morrison Reis, Norman Charlesworth and Louise Morrison Reis at the wedding of William and Andrena. Andrena and Charles belong to Reis Generation Four; their two sons are living and belong to Reis Generation Five. To return to the Reis Family page click HERE. NOTES: Andrena and Bill’s marriage certificate can be viewed HERE (<— PDF).